Hey MIDIbox community, first of all I want to thanks everybody participating in this project, since utilizing from the MIDIbox project really saved me a lot of time. In 2014 I started working on my DIY MIDI controller LambdaControl and can now proudly say that it is finished. I designed and build LambdaControl to support me during my upcoming live performances. Therefore, the controller consists of 10 channel that are fully integrated into Ableton Live. 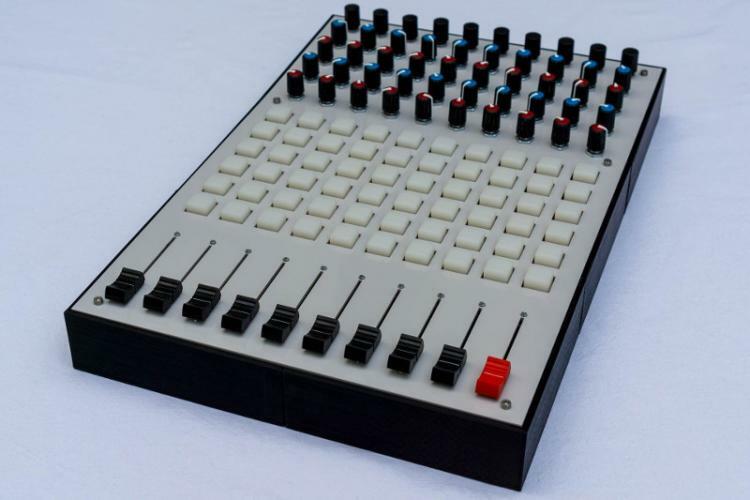 Each channel consists of a volume fader, six buttons for clip selection, four rotary potentiometers for effects, and an encoder with switch button functionality (could be used to control a looping mechanism). The normal components like the potentiometers or encoders are simply scanned by using the AINSER64 and DIN modules with a custom MIOS32 firmware. 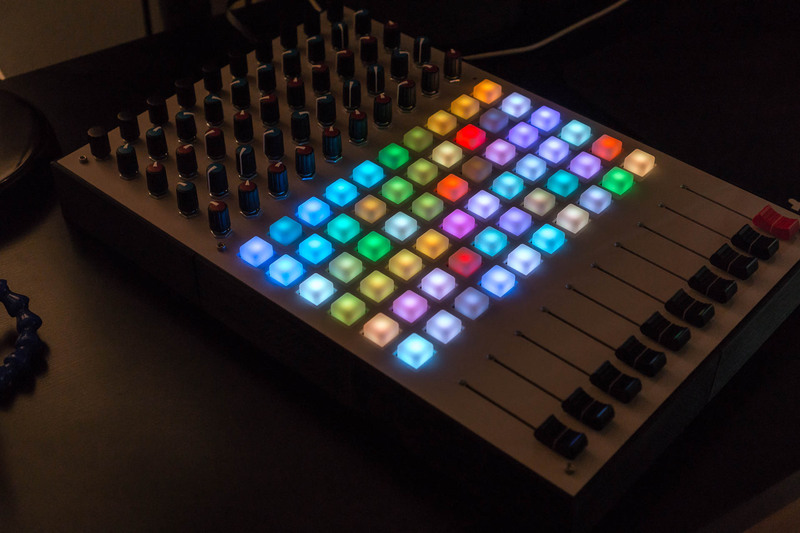 However, the special part of LambdaControl is the custom 10x6 RGB button matrix (based on button pads from Sparkfun), which is completely integrated into Ableton Live like a Novation Launchpad. For this purpose I connected a separate micro controller unit (MCU) via I2C to the MIDIbox core, which drives the RGB leds and reads the button inputs. The matrix MCU (16MHz Arduino Nano) can produce up to 4096 different colors by driving the matrix with a combination of multiplexing and Bit Angle Modulation (BAM). The matrix MCU still uses the shift registers of the DIN and DOUT modules to connect to the matrix rows and columns. This works really stable in the given scenario, but my implementation has some drawbacks like a low refresh rate or a relatively high input lag for the buttons (more in the documentation). This problems can be easily solved by using a MCU with more power or using a specialized IC like a TLC5958. However, it was a nice challenge to do everything in software on a limited hardware. Moreover, the parts used for the matrix MCU were with around 4€ really cheap. Additionally, I written a so called MIDI Remote Script, which integrates the by MIDI messages controllable RGB button matrix into Ableton Live. The MIDI Remote Scripts are python scripts that Live internally uses to integrate the different commercial MIDI controllers. The following picture shows that LambdaControl can be selected as every other control surface inside Live's preferences. The other screenshot shows the red rectangle that Live is rendering to visualize the position of LambdaControl's clip launcher that can be moved up and down by using the encoder on the master channel. I hope this information can help other people with their projects. That's a nice first post ! I would like to give some feedback on the MCU usage: I don't think that it's really required, the STM32F4 core has more than enough bandwidth to handle this as a "background task". According to your documentation you decided to use a separate MCU for this task due to limitations in MBNG. But this limitation only exists since I preferred less latency and universal usage (SRIO can be used for multiple purposes, not only for controlling RGB LEDs). If these design constraints wouldn't exist, we could simply control the SRIO on a similar way like you did in the MCU code. See APP_SRIO_ServicePrepare() and APP_SRIO_ServiceFinish() how to prepare and process a scan. Since the STM32F4 is pretty fast, there is no need to use a timer in your case. Just start the next scan once the last has been finished and buttons have been checked like shown in the tutorial. This results into back-to-back scan, where the update speed is a result of the number of SRs and the SPI transfer rate - both values are set in the example above. This way you could also store new RGB values in the DOUT registers. BAM should be possible by updating the DOUT register only each 2nd, 4th, 8th, 16th time. Actually, I first tried to implement it exactly like you proposed, but my BAM implementation always suffered from "randomly" appearing flickering. With my sketchy knowledge about MIOS32 and FreeRTOS, I were not able to solve this problem within an acceptable amount of time, such that I went the lazy way and used a separate Arduino Nano for the task, which I already had here lie around. But you are absolutely right, it should in general not be a problem to implement all of this with just the MIDIbox core. I think in my next project, I will go another way and use directly a specific LED driver like the TLC5958, since the feature set of this chip is really interesting. Sadly, they are just available in a SMT package, such that they could be a challenge for MIDIbox beginners. The wiki but I did not refresh it. The interfacing logic circuit is now on CPLD. And great work with your controller! Hi, driving the TLC5958 with the Core is not an easy way, features are amazing but it will require some more electronic as interface for the GSCLK. I wrote a software driver for it, it works without too much process. ButI added a CPLD between the two. your project looks really great. I just looked briefly over the datasheet of the TLC5958 and now understand your problem with the multiplexing. Using a CPLD to achieve a precise timing is an interesting solution. 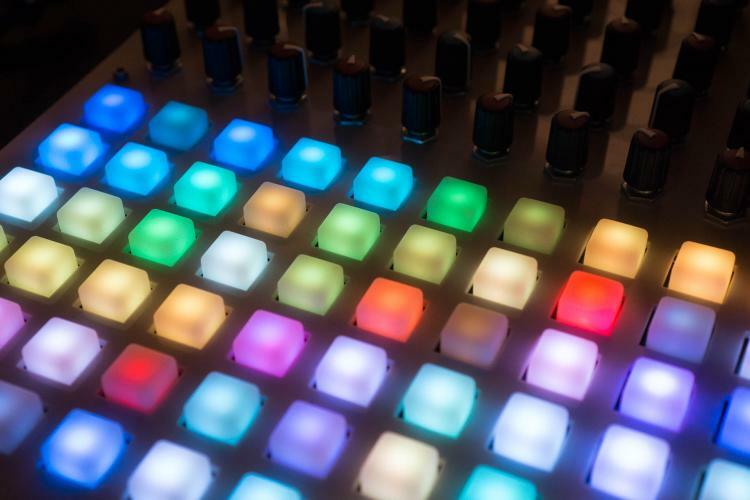 At the moment I am thinking about building a dedicated step sequencer that is fully integrated into the DAW, but I am just in the concept phase. When things get more precise, I will definitely take a deeper look at your solution.